← Passion Sunday: …on the Cross of Christ & unforgiving ire…. As we enter Holy Week (just a few more days of Lent!) instead of posting a movie something, today i would like to focus on Food. what? yep. Food – MEALS (& how we eat them.) Remember the Last Supper? when Jesus ate with the disciples? So yes, it does make sense to highlight the whole meal thing this week. So often we eat our meals ‘on the run,’ gobbling a hard-boiled egg or piece of toast as we run out the door… & at dinner time with our families, we go our separate ways with takeaway or sit like noncommunicative zombies watching TV. Last year i found the “Grace Before Meals” cookbook at Barnes & Noble (yes, Cookbooks are also overflowing from Va’s shelves all over the house! 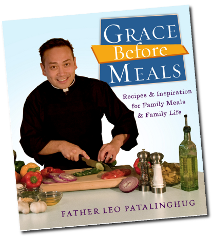 : ) but couldn’t resist this one because the ‘chef’ is a Catholic PRIEST – Father Leo Patalinghug. He & some friends started the “Grace Before Meals” movement to get more families to enjoy making meals & eating them together. Evidently he’s quite a Good Cook, having dazzled his seminarian buddies & even restaurant owners in Rome. Father Leo also recounts his surprise ‘Throw Down’ with Food Network Iron Chef Bobby Flay (one of his Food Heroes!) that really put the Grace Before Meals movement on the national & international map. Check out their website for recipes, emails, videos plus Father Leo’s cool blog. Since i am the Chief Cook & Bottle Washer for the Savvy Saints (my parents) & brother Dwight (he gets a specially packed lunch each day), i do try to make tasty meals. We have a Big Breakfast every morning & savory supper (altho sometimes Pizza sneaks onto the Menu when Cook Is Worn Out) but we do enjoy our meals together. It started Way Back… growing up in the Woodward Home for seven of us (five kids + parents) mealtimes were kinda special – not just the Food (my Mama was an AMAZING COOK!) but also family fellowship. For a few moments everyone had to Be Quiet & listen to even the littlest ones (ok, so that would be my younger brother & i!) to find what happened (re: prayers in the morning) & have a bit of Family Fellowship. Looking back those are precious memories i will never forget – & i knew that if my day was bad (being a Teenager is Not Easy!) my family cared… & if it was Good, they would celebrate with me! Sometimes after a long day the thought of cooking for your family can (moan, moan) be a chore. But it can also be an Opportunity… for fellowship, familyship & GOOD FOOD! 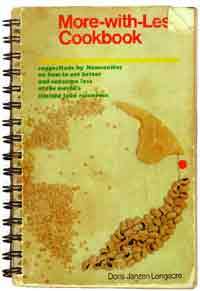 This entry was posted in Bookshelf (BOOKS), Lent and tagged Bobby Flay, Catholic cooks, Catholic priests, cookbooks, family dinners, family fellowship, Father Leo Patalinghug, Food, food network, Grace before meals, Lent recipes, meal ideas, meals, Mennonite, More with Less cookbook, recipes, tasty menus. Bookmark the permalink.